Off shoulder tops are everywhere right now — from street style sections, to fashion weeks, and even the leading celebrities — everyone has been bitten by this bug. 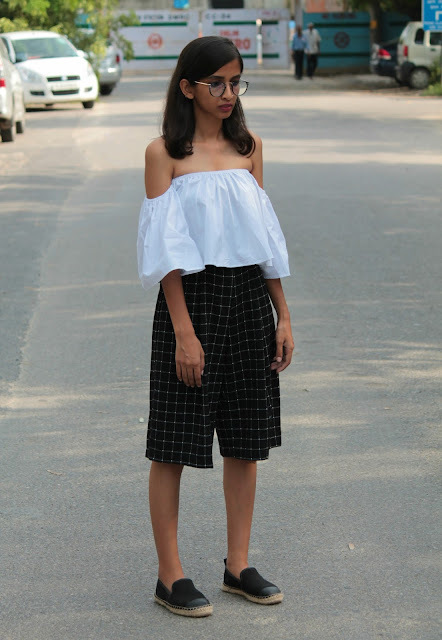 So when I bought this pristine white off-shoulder top, I decided to pull out its versatile side & style it in four different ways. This being the PART 1 of the two part series, I created two looks which are easy to be incorporated in your daily life without having any similarities. One thing that I decided was not to layer the top with anything over or under it and leave it for you to see that despite of that, all the looks were quite different from each other. My wardrobe has always been a mix of outfits purchased from streets & stores! From being someone who never owned a Zara piece till the second year of college to someone who now ends up impulse shopping, this journey as a fashion enthusiast has taught me a lot. Often people think that it is only branded clothes that can make them look good but in my case, there have been instances when I invested in a particular piece & it wore out too early to be expected. At times I feel a customised product would do more justice to the silhouette than the one available in the stores, be it due to the quality offered or the rate at which it is priced at. The beauty of heritage crafts like bandhani, phulkari or the traditional Kutch work have a certain kind of magnetism that always manages to attract me whenever I see a piece made of traditional textiles. Talking about Kutchi patterns, I have in past used clutches & handbags to style a look not just for the Indian vibe but because it effortlessly adds flamboyance to the overall attire while making it look elegant on the same time. The beautiful design, vibrant colours and the enigmatic mirror work that embodied this jacket swept me off my feet & I knew it would be a resplendent adornment to my wardrobe. Coming to the outfit, I wanted to create a look with a contemporary twist. Therefore, I wore the jacket as a crop top & paired it with a denim tube skirt with patch detailing which perfectly added that modern vibe! Accessorised with these dainty golden jhumkis & finally slipped into my favorite tan brogues.